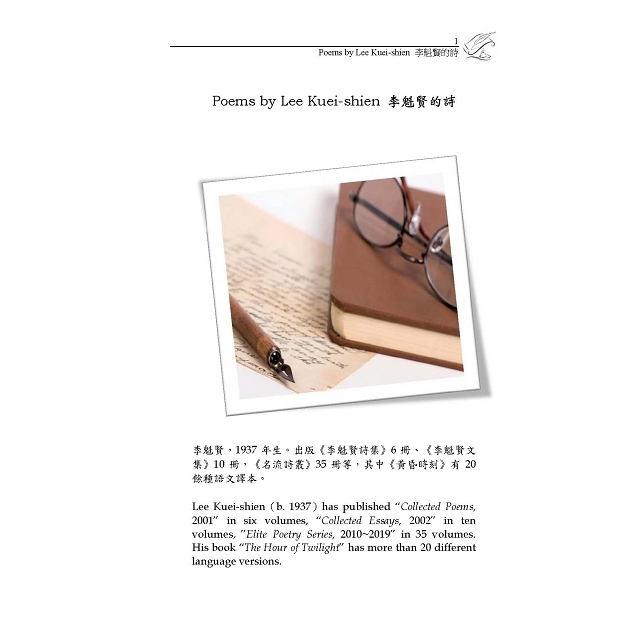 This Poetry Collection contains of works by eleven Taiwanese poets: Lee Kuei-shien, Li Yu-fang, Hsieh Pi-hsiu, Lee Chang-shieng, Lin Lu, Tsai Jung-yung, Chen Ming-keh, Lin Sheng-bin, Chen Hsiu-chen, Wang Shao-chun and Yang Chi-chu. 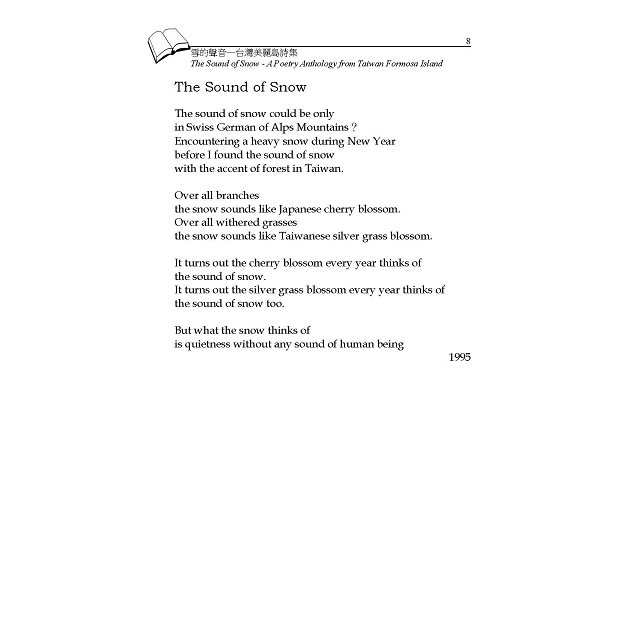 Lee Kuei-shien（b. 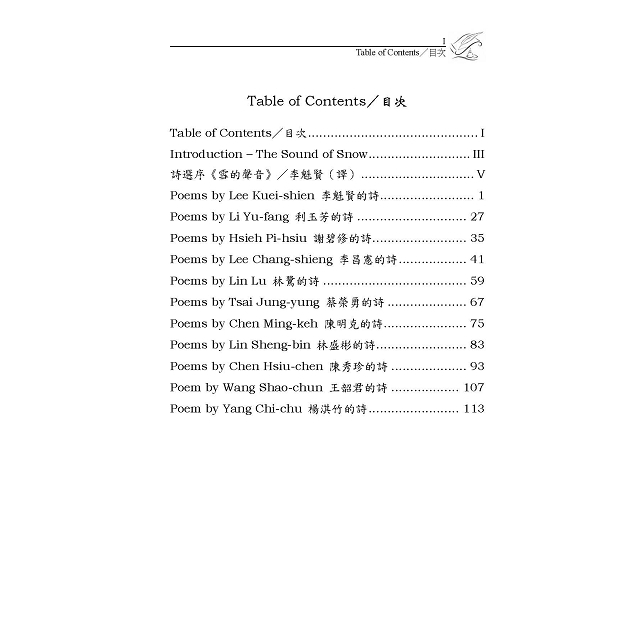 1937）has published “Collected Poems, 2001” in six volumes, “Collected Essays, 2002” in ten volumes, ”Elite Poetry Series, 2010~2019” in 35 volumes. His book “The Hour of Twilight” has more than 20 different language versions. 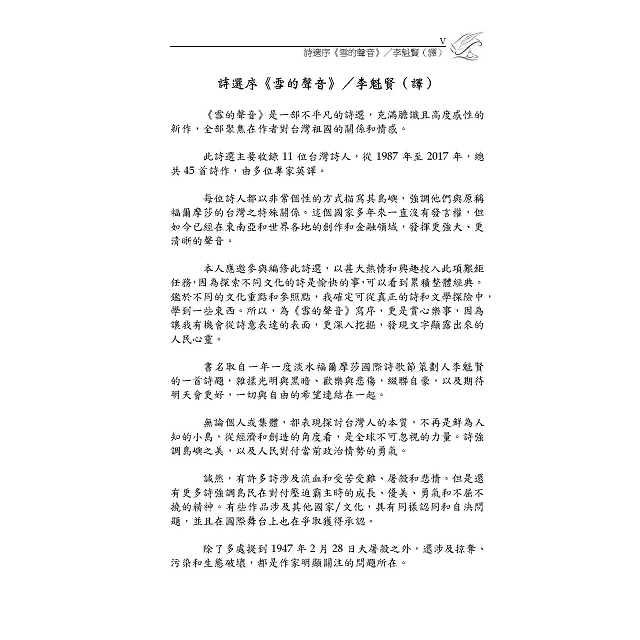 Li Yu-fang（b.1952）has published “The Taste of Living, 1989”, “Sunflower, 1991”, “The Morning to drink Roselle Tea, 1996”, and “Lantern Flower, 2016”, and others. 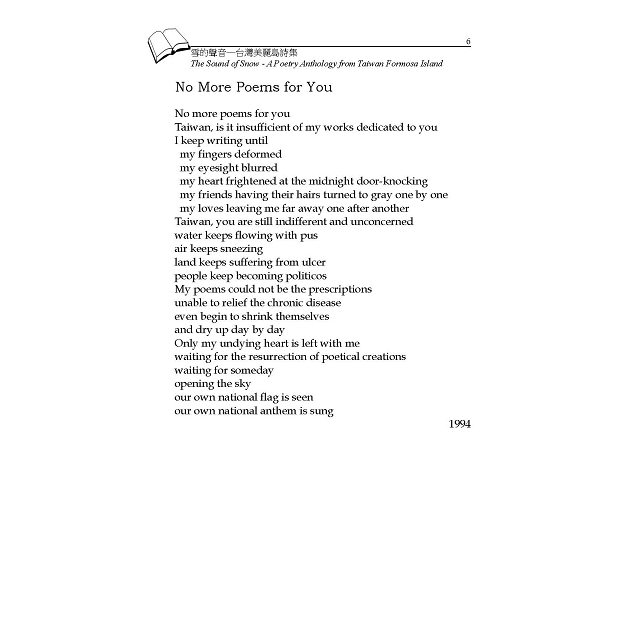 Hsieh Pi-hsiu（b.1953）has published “Collected poems of Hsieh Pi-hsiu, 2007” and “The Sparks in the Life, 2016”. 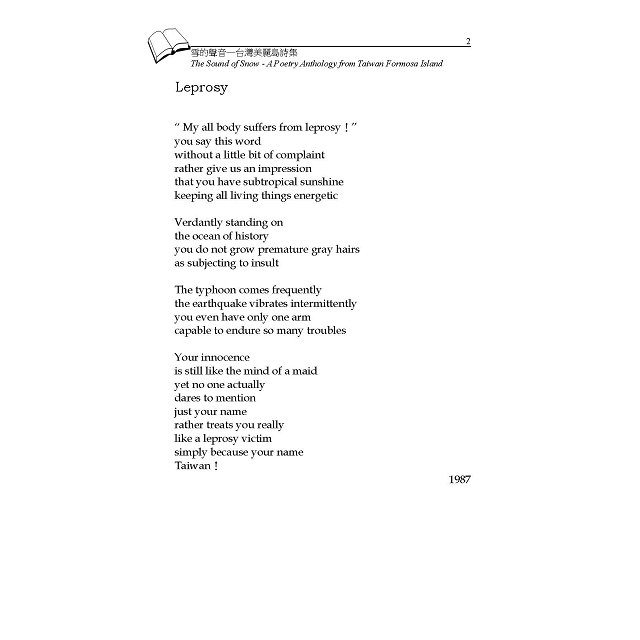 Lee Chang-hsien（b. 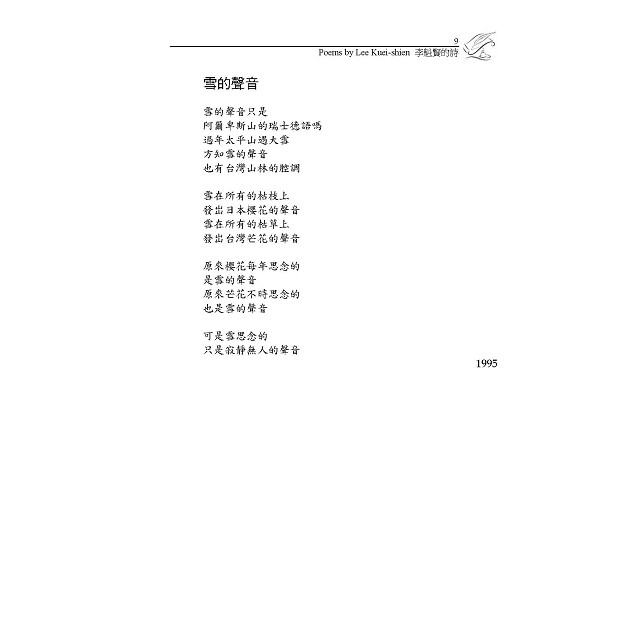 1954）has published “Poems of the Processing Zone, 1981”, “Ecology Collection, 1993”, “On the Production Line, 1996”, “Love River, 2018” and others. Lin Lu（b.1955）has published “Star Chrysanthemum, 2007”, ”Lost in Time, 2016”, “For What to Travel, 2017”, and “Forgetting Autumn, 2017”. 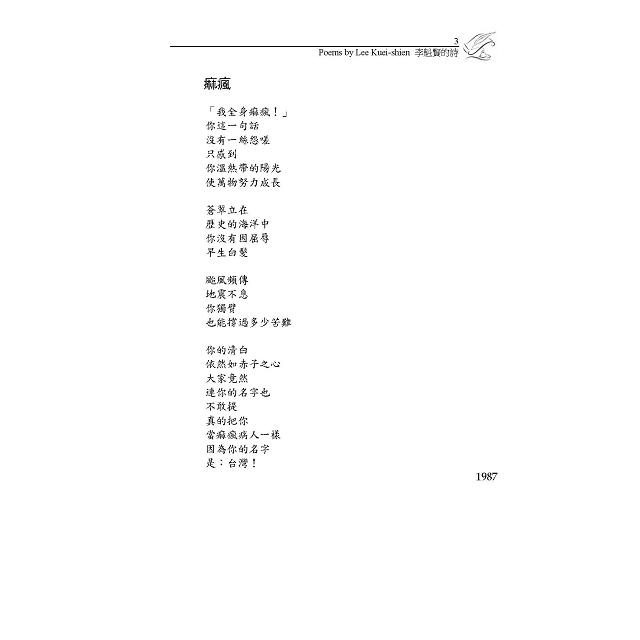 Chen Ming-keh（b. 1956）has published “The Ground, 1990”, “Years, 2000”, “Dance of Angel, 2001”, “Dark Road, 2005”, and “Earned Spring, 2005”. Lin Sheng-Bin（b. 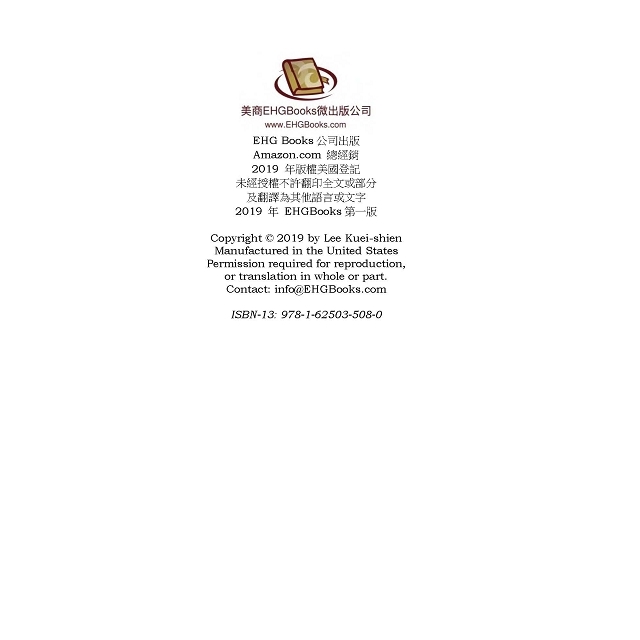 1957）has published “The War, 1988”, ”The Family Genealogy, 1991”, ”The Wind blows from my deep heart, 2002”, “Contemplate and Meditate, 2010”, “Blowing wind and Beating heart, 2012” and others. Chen Hsiu-chen（b. 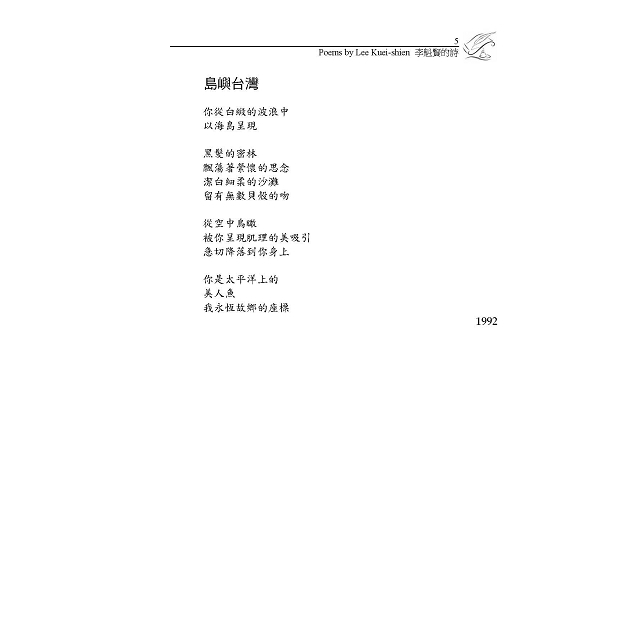 1960）, has published “String Echo in Forest, 2010”, ”Mask, 2016”, “Uncertain Landscape, 2017”, “Promise, 2017”, “Poetry Feeling in Tamsui, 2018”and “Frcture, 2018”. Wan Shao-chun（b. 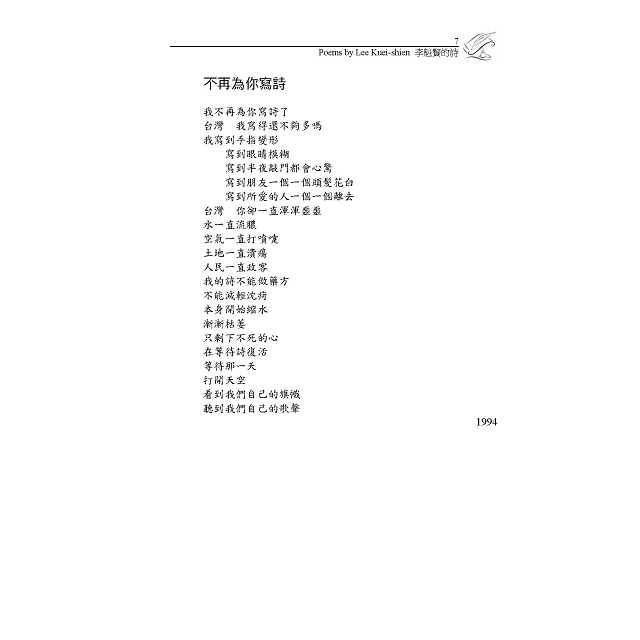 1980）has contributed her poems to “Taiwan Modern Poetry” frequently. Yang Chi-chu（b. 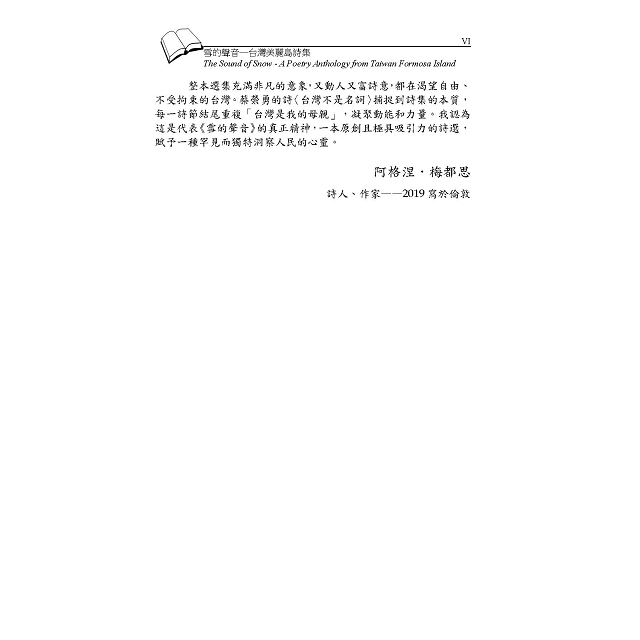 1981）has published “Living Among Cities, 2016”, “In the season of Summer Lotus Blossom, 2017” and “Tamsui, 2018”. 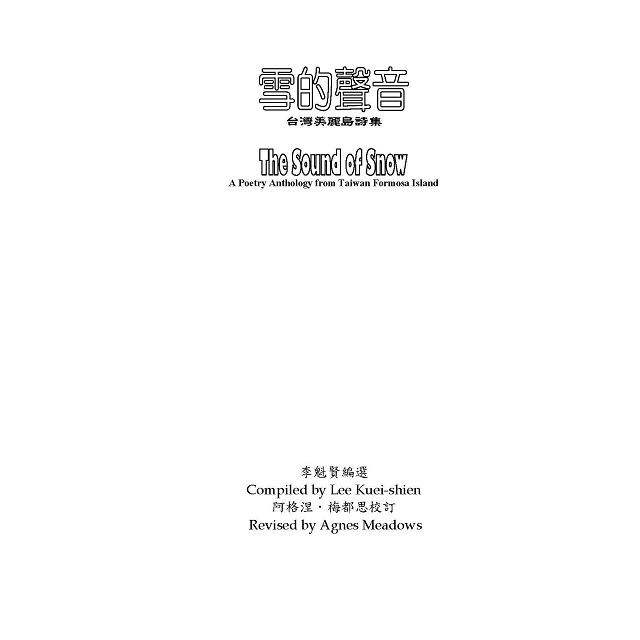 “The Sound of Snow” is an extraordinary collection of poetry filled with bold and highly emotional new work all focusing on the writers’ relationship with, and feelings about, Taiwan, their homeland. 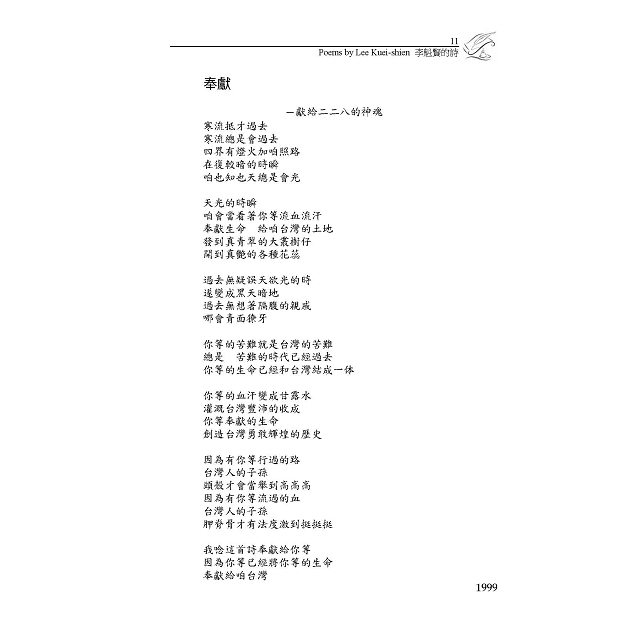 The collection features the work of 11 Taiwanese poets, with a total of 45 pieces, composed between 1987 and 2017, and translated into English by a number of specialists. 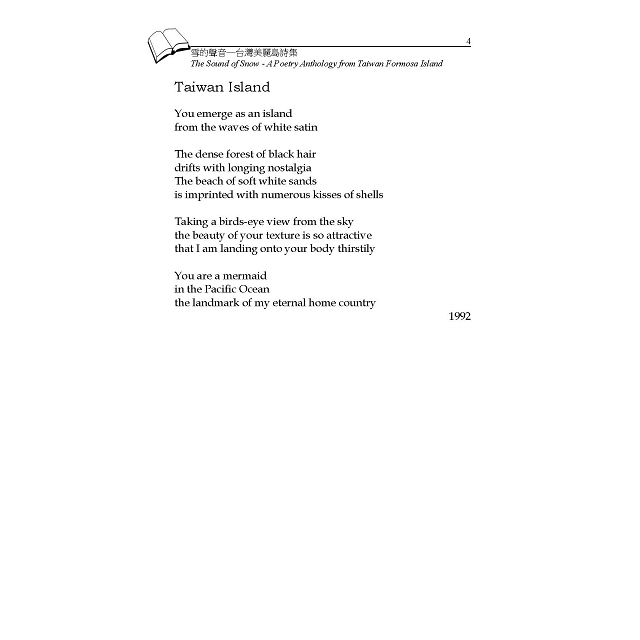 Each poet writes in a very personal way about their island, emphasising the special relationship they have with Formosa, as Taiwan was originally called. It is a country that was voiceless for many years, but has now found a stronger and more articulate voice with the creative and financial arenas in both South East Asian and around the world. I was originally asked to revise and edit the collection, a formidable task, but one I undertook with great enthusiasm and interest, because it’s always a pleasure to explore the poetry of a different culture, to see what has been added to the overall canon. Given the different cultural emphases and reference points, it was certainly something I learned from…a true poetic and literary adventure. 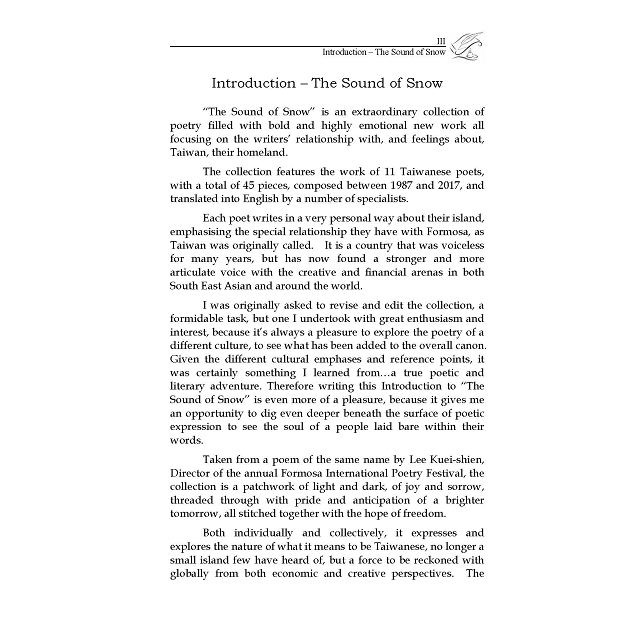 Therefore writing this Introduction to “The Sound of Snow” is even more of a pleasure, because it gives me an opportunity to dig even deeper beneath the surface of poetic expression to see the soul of a people laid bare within their words. 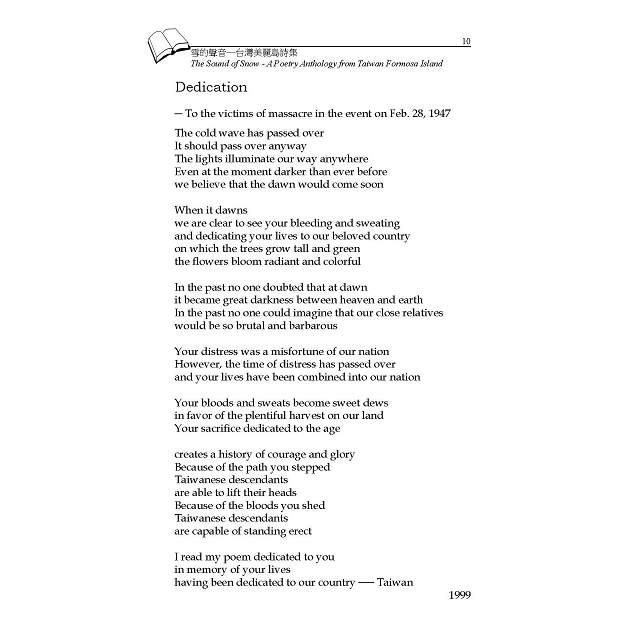 Taken from a poem of the same name by Lee Kuei-shien, Director of the annual Formosa International Poetry Festival, the collection is a patchwork of light and dark, of joy and sorrow, threaded through with pride and anticipation of a brighter tomorrow, all stitched together with the hope of freedom. Both individually and collectively, it expresses and explores the nature of what it means to be Taiwanese, no longer a small island few have heard of, but a force to be reckoned with globally from both economic and creative perspectives. The poetry underlines the island’s beauty, and the courage of its people in dealing with its current political situation. Yes, there are many references to bloodshed and suffering, to martyrdom, massacre and misery. But there are many more that underline growth, beauty, courage and the indomitable spirit of the island’s inhabitants in dealing with a repressive overlord. 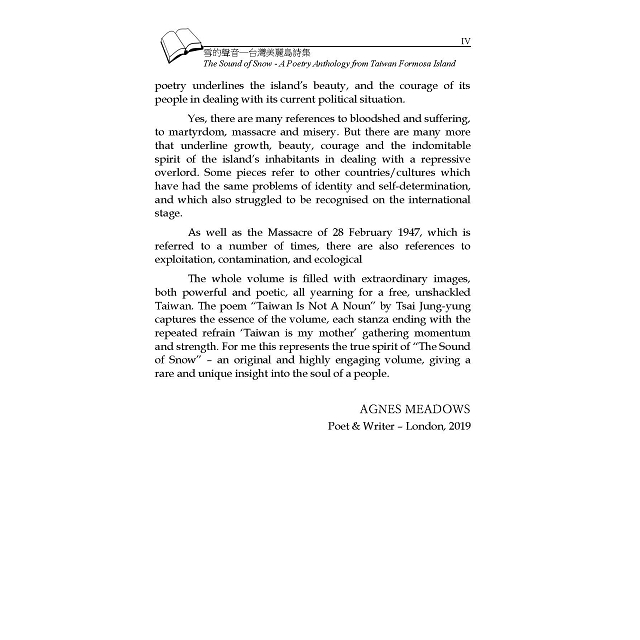 Some pieces refer to other countries/cultures which have had the same problems of identity and self-determination, and which also struggled to be recognised on the international stage. As well as the Massacre of 28 February 1947, which is referred to a number of times, there are also references to exploitation, contamination, and ecological damage, which is something else the writers are clearly concerned about.